In connection with a March 9, 2012 order that allowed Apple to take certain depositions out of time in order to make up for Samsung's lack of cooperation, I already wrote that "Apple has also tried to be no more forthcoming with documents than it's legally required to, but I believe it's fair to say that Samsung has made more attempts to play tactical games and, in some cases, to stall", and that "Samsung has been particularly uncooperative when Apple touched on sensitive issues", all of which I attributed to Samsung being "on the defensive" and therefore having "less of an interest in the progress of those [Apple-Samsung] lawsuits". Now Samsung and its lawyers have gone way too far in their attempts to stall. This is not the first time that Samsung is found guilty of non-compliance with a discovery order in this particular litigation (for the current scope of that lawsuit, please check this very recent post, which lists all of the parties' current assertions as well as recent withdrawals of claims). 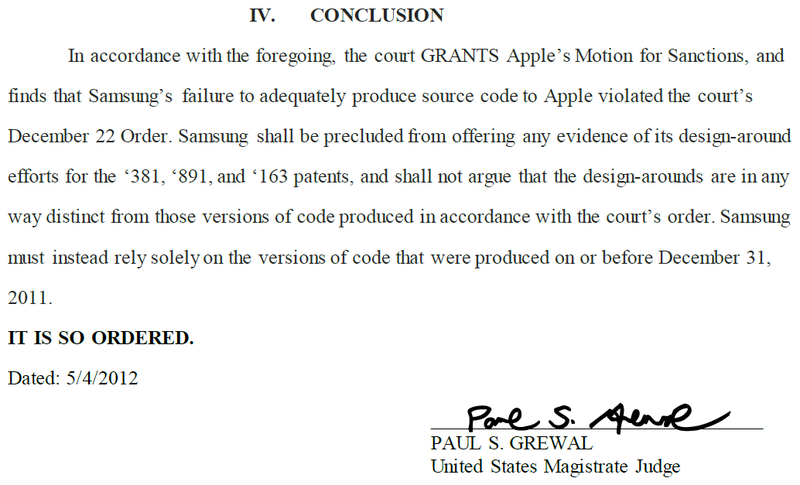 On April 23 (less than two weeks ago), Magistrate Judge Grewal already ordered less drastic -- basically just monetary -- sanctions against Samsung for failure to provide on a timely basis internal documents relevant to Apple's willful infringement (copycat) claims, such as internal emails that show Samsung's designers and engineers analyzed Apple's products in detail, and six categories of "sales and financial information relevant to establishing damages". 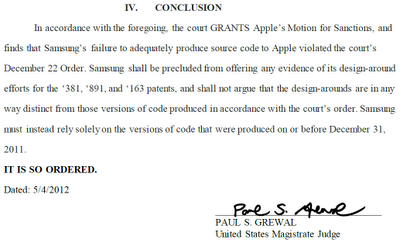 Those issues were subject to different discovery orders, but Samsung's conduct was sanctioned by the same order. One important difference between the April 23 and May 4 orders is that Magistrate Judge Grewal was able to protect Apple's interests with a view to the trial scheduled to commence on July 30 (though too late for the December decision on Apple's first motion for a preliminary injunction) in a way that he felt still fits within Judge Lucy Koh's case schedule. But source code analysis is a very time-consuming effort, which is why Magistrate Judge Grewal had no alternative to precluding Samsung from presenting at trial evidence concerning the "design-around" code it withheld for too long. This has important implications. The order notes that "by their very nature design-arounds impact key questions of liability, damages, and injunctive relief". In other words, Samsung may have to assume liability for continued use of old, possibly infringing code because the new, possibly non-infringing code wasn't shown in time. In light of that, it's a given that Samsung will appeal this order to Judge Koh, the federal judge presiding over this litigation. For U.S. Patent No. 7,469,381 ("overscroll bounce" patent, described by Apple in this filing as "rubber-banding effect when over-scrolling"), Samsung started shipping its "blue glow" workaround last summer. I bought a Galaxy Note a couple of months later and it also has the "blue glow". I linked to videos that show the overscroll bounce as compared to a glow (not blue, but still a glow) in a blog post back in August 2011. According to the order, Samsung "did not produce any 'blue glow' source code until January 23, 2012" -- more than three weeks after the deadline set by the court. That was actually the smaller one of the delays that resulted in sanctions. I know the blue glow and the '381 patent. The blue glow undoubtedly steers clear of infringement of that patent, so in a way it would have been in Samsung's own best interest to enable the court to consider it. Also, the blue glow is technically very simple -- it's not like Samsung had to withhold anything from Apple that even the least-skilled engineer at Apple could easily do. Maybe they didn't want Apple's lawyers to look for infringements of other patents, but since Samsung ultimately delivered that code, it had nothing to gain by delaying the production of this material. Even though the court had set a December 31 deadline for the design-around source code and a March 8 general cut-off date for fact discovery, "Samsung did not produce source code for its '891 and '163 design-arounds until March 10 and 12, 2012--after the close of fact discovery--knowing full well that the court would not grant the parties any exceptions". The '891 patent is U.S. Patent No. 7,853,891 (timed window), and the '163 patent is U.S. Patent No. 7,864,163 (tap to zoom and navigate). I don't know what the related design-arounds are, but according to the order, they were "in commercial release months before the deadline". Magistrate Judge Grewal clearly thought very hard about what kinds of sanctions would be needed. His order starts with a detailed explanation that reflects his thorough understanding of the issues relating to source code production and how companies feel about it. But Samsung's non-compliance was just too outrageous. Therefore, the court granted Apple's motion (here's my blog post on the motion for sanctions, entitled "Samsung's designarounds present Apple's source code analysis with moving targets") in its entirety. The implications for Samsung go beyond the upcoming trial. It's now been identified by the court as a recidivist violator of discovery orders. This will have implications on any decisions on sanctions Apple may have to request in the course of the second litigation between these parties before the same court. Samsung's actions against Apple appear increasingly desperate. Apple has not yet dealt Samsung a knock-out blow. The drop-out rate of Apple's claims is very high, but Samsung's drop-out rate, to date, is 100%, which means that Apple's victory is only a matter of time. The only way Samsung thinks it can have leverage over Apple (in order to force Cupertino to tolerate Android's infringement of Apple's intellectual property) is the abuse of standard-essential patents. The European Commission is formally investigating Samsung's related conduct. The Commission is another institution that Samsung needs to deal with on more than this one issue. It should think really hard about the strategic implications for its credibility and reputation, looking far beyond the dispute with Apple. Samsung should withdraw all of its requests for injunctive relief based on standard-essential patents on a worldwide basis, and it should comply with the courts' discovery orders.